Post marked ‘Brighton & Hove East Sussex 23 Aug 1976’ this card was obviously posted after Ida’s return from Stratford-upon-Avon, as indicated in the text, which again is a quick ‘keep in touch’ status update. This is another ‘school summer holiday’ card from from Ida, updating me on her travels; although the notes are always brief, I received a great many of them over the years. I have now emailed the blog link to Ida, so I am hoping she is ok with it and that we can meet up again at some point. 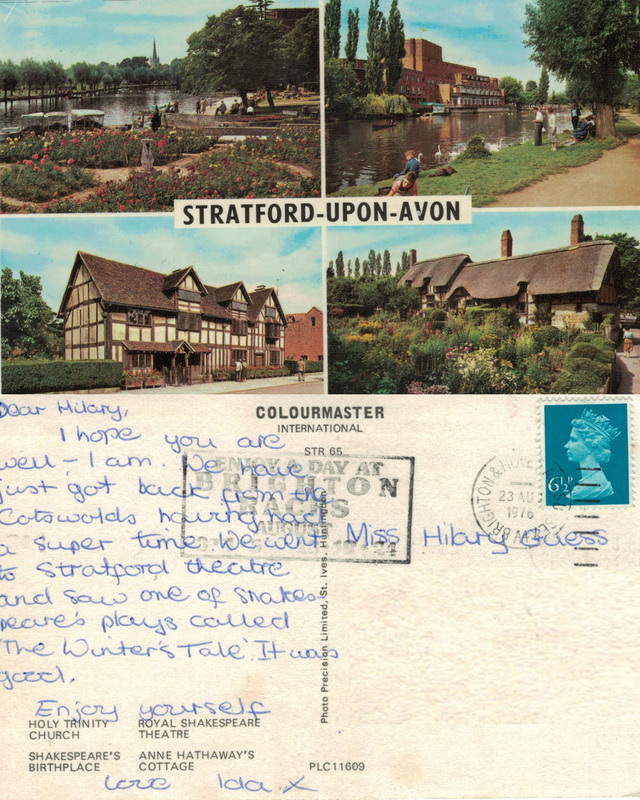 This entry was posted in art, autobiography, Correspondence, holidays, Nostalgia, Postcards, Social History, Travel and tagged friends, holidays, postcard, postcards, school, Shakespeare, status updates, Stratford-upon-Avon. Bookmark the permalink.